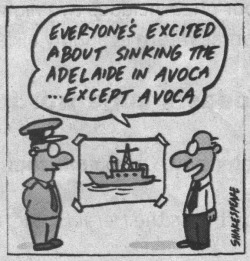 The No Ship at Avoca mob managed to stall the scuttling of the HMAS Adelaide last Saturday at the last moment just 2 days before it was due to be towed up from Sydney and sunk. They were unable to lodge an appeal until Minister Garrett approved the order to sink , which he seakily done on the Wednesday afternoon. The No Ship group lodged an appeal next morning on the Thursday and were granted a 1 month stay until the whole proposal can be looked at properly this time. Supporters of the sinking met last Sunday at Terrigal Skillion and they numbered about the same as the anti - ship mob did a couple of weeks back. Due to an all out flamewar on Facebook the No Ship mob shut down it's page leaving bewildered trolls nowhere to go for the evening. Whatever happens it looks like the ship won't be sunk for over a year now until it all goes through court. I joined this group at Facebook " Save the Sacred land at Kariong " , these guys are helping stop the proposed development along Bambara Rd at Kariong and I thought I'd lend them a hand. The developers have been trying to get at this land for decades and Gosford Council has usually opposed any propsals , the NPWS has tried to buy back the land but the owners want more than they can afford. This time the developers have enlisted a consulting mob who know the game so things look a bit of a worry , this land is still recovering from farming activities in the early 1900's and should be left as it lies near Aboriginal sacred land and carving sites. As well as that there are hundreds of native species of flora and fauna living in this area and it is in a bushfire danger zone. Finally I have laid my hands on a copy of King Bungarees Pyalla , a small book with stories told to the author by the local Aborigine legend Bungaree who was from the Woy Woy tribe. A local researcher , Kay Williams was kind enough to photocopy the entire book for me and I've been reading it the last couple of days. Like Kay , I was hoping this may give an insight into the life and history of the local Woy Woy tribes , but was semi disapointed when it only contains stories relating to animals and some folklore like the Bunyip , later in the book there are stories told by the author about the Aborigines of the time. The names and places mentioned are unknown to me , they sound like they could be out west near Parramtta at the time. One of Bungaree's traits does show out though and that is they way he modified some of his tales to suit the white man by giving the characters English names and comparing things to English customs and way of life , he was a great interpreter and could change his persona to suit whatever company he was in at the time. The last 2 stories are told by the author and tries to portray the kind side of the Aborigines who on a couple of occasions used their tracking skills to find lost white children.
" the legends I have chosen , from the Pyalla , are only a few of the many I heard in childhood , but they may serve to give some sort of idea of the style of stories existing among a people , who , with their legends and romances , will have soon passed away forever ""
Another member is Anthony Dunk who has this bushwalking page which is another "add to bookmarks"
All those links should keep ya busy til next time ! What a wonderful post full of different bits and pieces! Well done, on the No Ship moratorium. Good luck with that one. We have a fight about dredging that I shall write about soon.